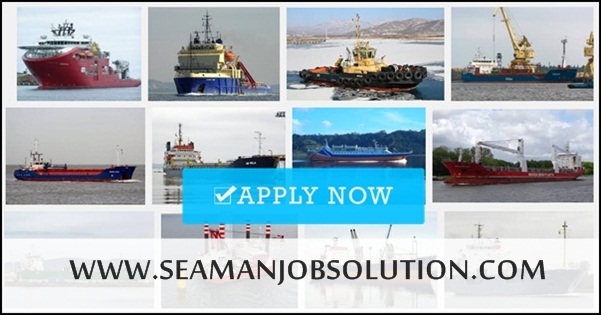 SEAMAN JOB INFO - ORIENT SHIP MANAGEMENT & MANNING PVT. LTD. Available hiring jobs and recruitment for Indian seafarers crew working onboard in cruise vessel, container vessel, VLCC. OSMM gives their employees opportunity to have diversified experience of working on Bulk Carriers, Petroleum Tankers, Chemical Tankers and various other types of ships, including Cruise Vessels. OSMM offers good carrier opportunities with fast promotions and facilities for the floating staff to call their family to sail on the ships. Company Guest Houses are also available in Mumbai & New Delhi for outstation officers. Urgently required follow ranks with relevant rank experience for our foreign principal. 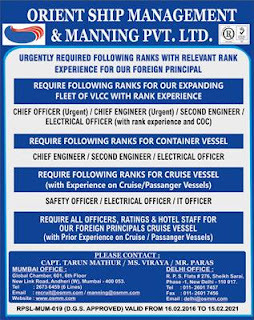 0 Response to "Recruit Crews For Cruise, VLCC, Container Vessels (India)"